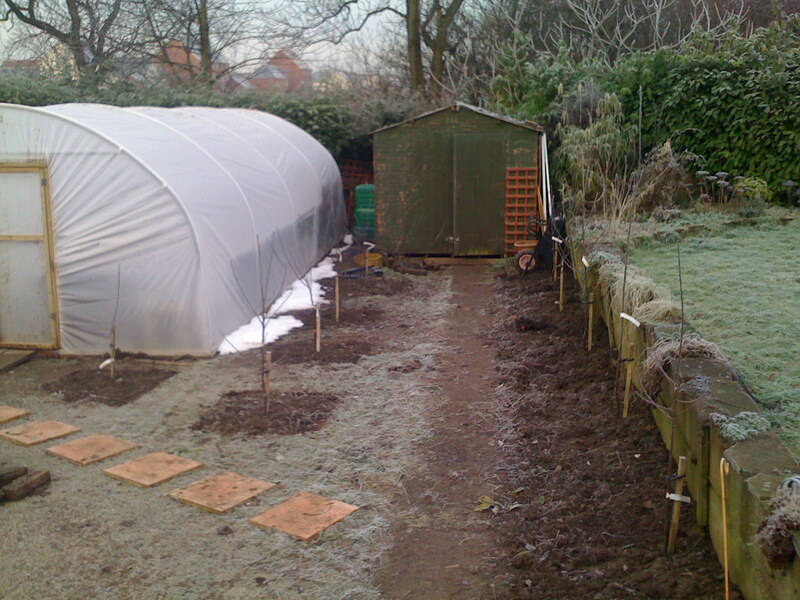 This post has been a long time coming – I think I’ve been looking at trees for a couple of years, and planning this particular orchard for about 9 months! Finally, the trees have arrived and are in! We’ve beaten the weather (finding a two-day slot in between heavy coverings of snow) and here are the pictures to prove it. I haven’t got any pics of the raspberries or the peach yet – I’ll post them when I can. I’m really keen to have as many permanent plantings as possible – I don’t want to be dependant on my year-in, year-out digging skills – so we’re putting in a nice compact orchard. This should give us most of our fruit once it gets going, and then I just have to worry about the veg. These are £14.30 each, and are all on M26 rootstock except for the Sanspareil, which is on the smaller M27. The Semi-Dwarfing M26 should produce trees 2.5-3.5m high, and the Dwarfing M27 only 1.5-2m. The descriptions from Agroforestry are excellent, so I’ve reproduced them below so that I don’t forget! I tried to get a mix of good-keeping eating & cooking apples plus apples for cider and juice. Ashmeads Kernel: Dessert apple. Pick October, use Dec-Feb+. Flower group D. Fruit medium-sized, greenish-yellow with some russet. Flesh aromatic, excellent flavour. Tree moderately vigorous. Also used for cider & juice. Braeburn: Dessert apple. Pick Oct, use Oct-Feb. Flower group D. Good crisp flavour – new clone suitable for planting in the UK. Good crops of medium size red fruits. Dabinett: Cider apple. Very reliable, producing a high quality juice. Golden Harvey: Dessert apple. Pick October, use Dec-Mar. Flower group D. Fruit round, golden; flesh aromatic with an intense rich flavour. Tree vigorous, good cropper. Good cider & juice apple. Howgate Wonder: Cooking apple. Pick October, use Nov-March. Flower group C. Large fruits, good for juice & cider. Vigorous tree, heavy cropping. Keswick Codlin: Cooking apple. Pick & use Aug-Sept. Flower group B. Medium sized greenish-yellow fruit, cooks to a good puree. Tree has ornamental flowers. Part self fertile. Sanspareil: Dual purpose apple. Pick October, use Nov-April. Flower group C. Large fruit flushed & streaked scarlet. Flesh juicy, crisp, aromatic, good balanced fruity flavour. Also used cooked. Heavy cropper with ornamental flowers. 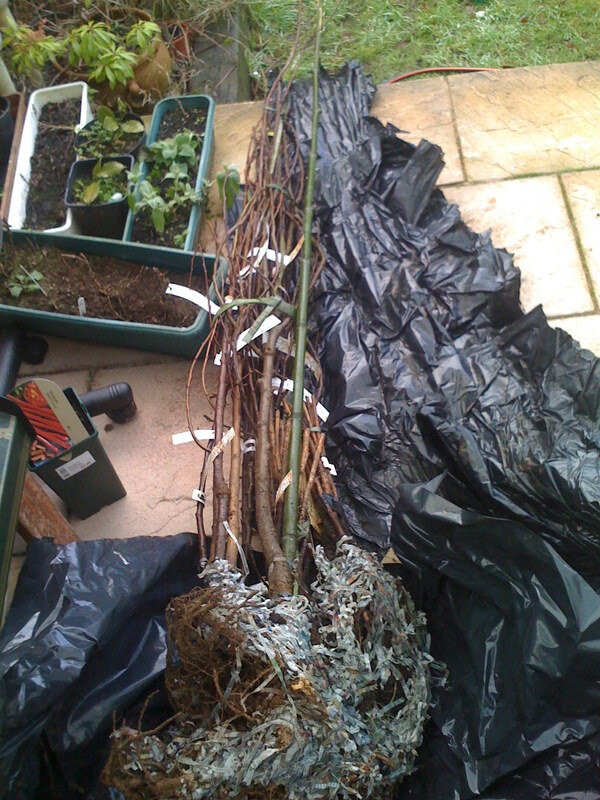 Also £14.30 each, the Concorde on Quince A (4.5m high) rootstock, and the Williams Bon Chretien on Quince C (4m high). Concorde: Dessert pear. Pick October, use Oct-Jan. Flower group E. Fruit medium-large, pale green turning yellow. Flesh pale yellow, sweet and juicy. 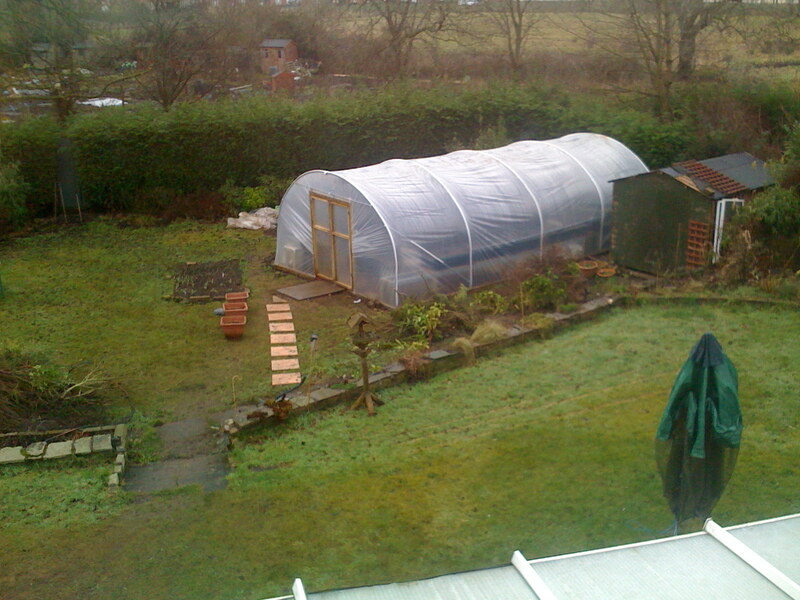 Very heavy cropping, compact grower. Quince A rootstock produces trees about 15 ft (4.5m) high. Williams Bon Chretien: Dessert pear. Pick & use Aug-Sept. Flower group D. Fruit medium-large, pale green turning golden yellow. Flesh very juicy and sweet. Self-fertile. 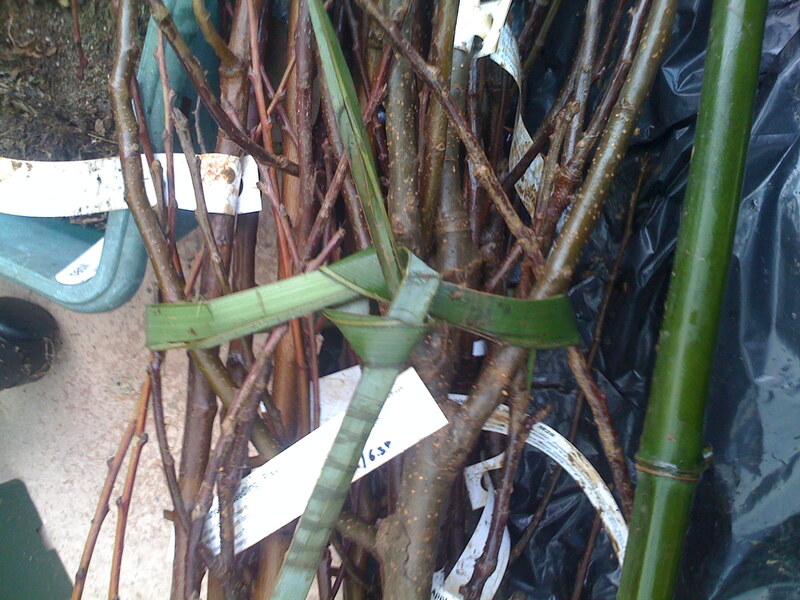 Again, £14.30 each, all on Pixy rootstock, which’ll limit them to 3.5-4m. Marjorie’s Seedling: September-October. Flower group E (psf). Fruit large, flesh firm, juicy, quite sweet, good flavour, hangs well on tree, good cooked. Tree vigorous, upright, heavy cropping. Victoria: August-September. Flower group C (sf). Large fruit of good flavour fresh or cooked. Tree very heavy cropping, hardy, vigorous, a good pollinator. Oullins Golden Gage: August. Flower group D (psf). Yellow fruit, flesh firm, sweet, good flavour, also good cooked. Tree large, vigorous, upright, fair cropper, good pollinator. 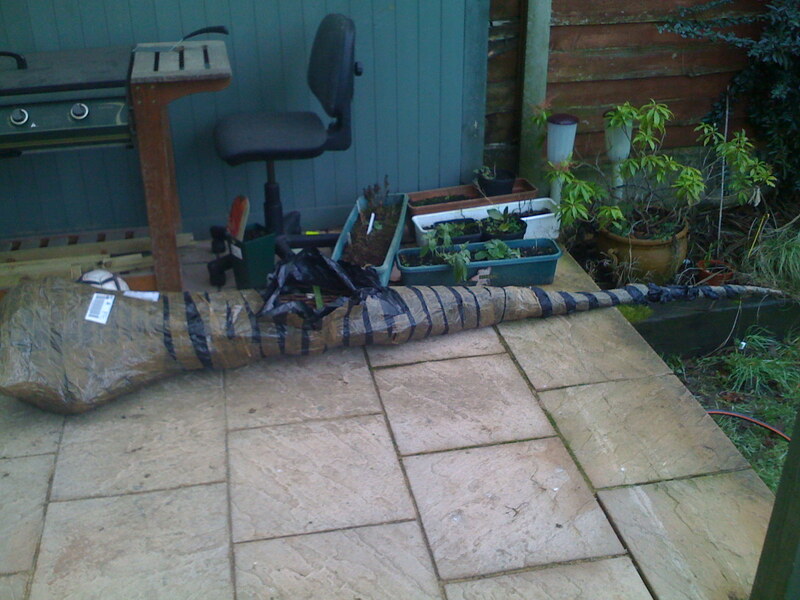 Grown on St Julian A rootstock, it’ll get to 3.5-4m high, and cost – £14.30! Redwing: Fruits very dark red, superb flavour, late flowering, bears good crops. This variety has some resistance to peach leaf curl. The late flowering means it’s more suitable to our northerly climate! Not strictly for the orchard, but we’ll be planting them at the same time. They are sold at £12.65 for a pack of 10. We’ve tried to go for a good range of fruiting times so that we have the longest possible season – I love raspberries! Autumn Bliss: Ripens mid-August onwards. Heavy crops of large red fruits. Canes medium high – easy to support. Allgold: Autumn fruiting. Recent variety with yellow fruits – less likely to be eaten by the birds! Glen Moy: Early season. Canes erect, spineless. Bears good crops of easily picked large fruits of good flavour. Tulameen: Mid and late season. Fruits very large, good quality. Canes with few spines. So that gives you a flavour of what we’ll be planting in early December – at the moment the places they’ll be planted are full of grass or ornamental shrubs. 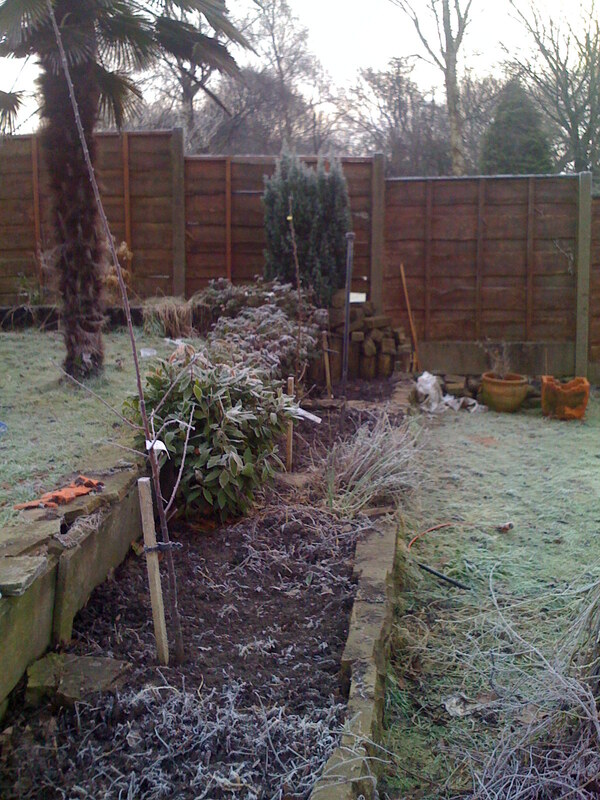 If anyone want a free mature shrub, come down and bring a spade! Fruits very dark red, superb flavour, late flowering, bears good crops. This variety has some resistance to peach leaf curl. Cobnut trees are hardy and grow well on a wide range of soils except those that are waterlogged, but like all plants they grow best in soil conditions that suit them. They prefer a good friable topsoil overlying a free draining substrate. A soil that is too fertile will tend to produce trees with excessive vigour, which will not crop well. However, it is still possible to grow reasonably sized and cropping trees on stony ground as long as there is sufficient soil and good drainage. Cobnuts are largely self sterile – the pollen from a given variety cannot pollinate the same variety. If you live in the countryside where there are plenty of wild hazels nearby, then these will probably pollinate your trees. A neutral to alkaline soil is ideal, but cobnuts also grow well in more acid soils. 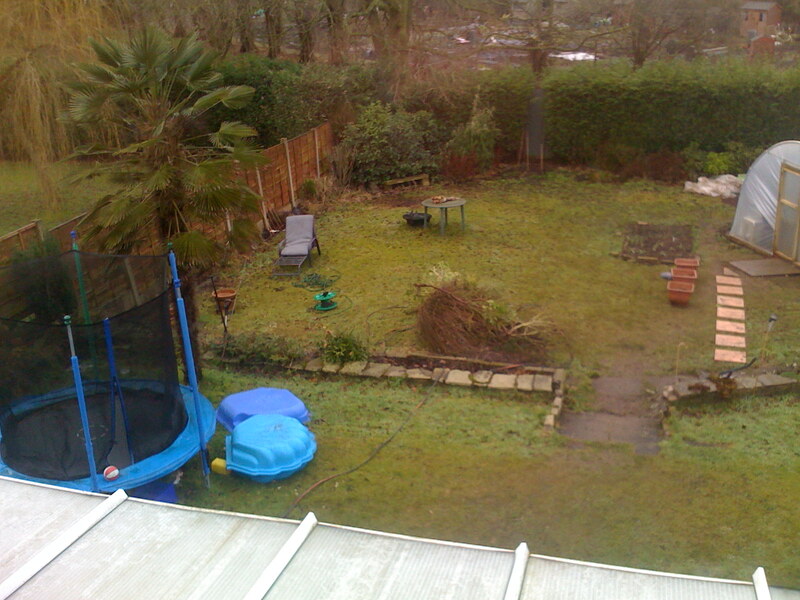 Trees are sold online bare-rooted when dormant (usually between Nov-March). I’ve missed my chance for this year, but the nurseries start taking orders from April, so once I’ve got my head around the different varieties I’ll get on and order some.